Living a healthy lifestyle is a job of its own, sometimes requiring you to track all facets of your daily life. Needless to say, it can be overwhelming, but lucky for us, there are various gadgets out there that get the job done for us. 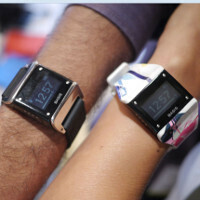 During the CE Week Line Show in New York, we got up close and personal with a unique health tracking gizmo, the Basis band health tracker, which monitors its users’ fitness activity, heart rate, sleeping habits, and much more! We’ve seen something very similar like this before, and in fact, our first impression about the Basis band is that it looked very similar to the MOTOACTV, Motorola’s fitness oriented accessory. When it’s worn, it looks like a fancy filled digital watch, seeing that it displays the time – while other pertinent details are shown as well. Separating itself from other wrist-based offerings, there’s a level of personalization that those other devices lack, seeing that there are different stylish looking bands that are available with the basis. At the same time, it’s packing a comprehensive set of hardware to track our activity, which is profoundly evident as we look to its rear. Specifically, it’s packing sensors that measures blood flow through your skin to estimate your heart rate, accelerometer to measure how many steps you’ve taken & movement during sleep, perspiration monitor to measure your workout intensity, and another sensor that measures skin temperature. Rather than relying on an estimated figure for the amount of distance covered that’s calculated by a pedometer, the Basis band provides for more accuracy due to the BPM (beats per minute) sensor it’s packing along. Complementing the hardware, there’s an online portal that allows users to see their fitness activity too – enabling them to visualize their progress. And if you happen to have an Android powered smartphone, you can use the accompanying app for Android to sync over the stored information in the Basis band via Bluetooth to your device – thus, giving users yet another hub to view their activity. Right now, the Basis band is available for $199, which might seem pricey, but when you factor in all the sensors it’s packing along for the ride, combined with the personalization aspect of its stylish bands, it can prove its worth to those fitness conscious individuals out there. Pretty cool. If it also plays music and can sync up with bluetooth headphones I'm in!